Last week I took a short break from Sunday Stills to travel to San Diego for my high school’s 40th year class reunion (1978). Did you enjoy the break? I know a few bloggers posted a couple of Sunday Stills’ favorites! By the looks of my e-mail inbox, I see more folks are posting more often now that summer is over, and we are back to our normal routines. By mid-September, everyone who is going to school is back by now, even the universities on quarter system. The traffic on the roads has definitely picked up in my area! This week’s theme is “back to school’ which can have the potential for a lot of ideas. As a university lecturer, I went back to school at the end of August. 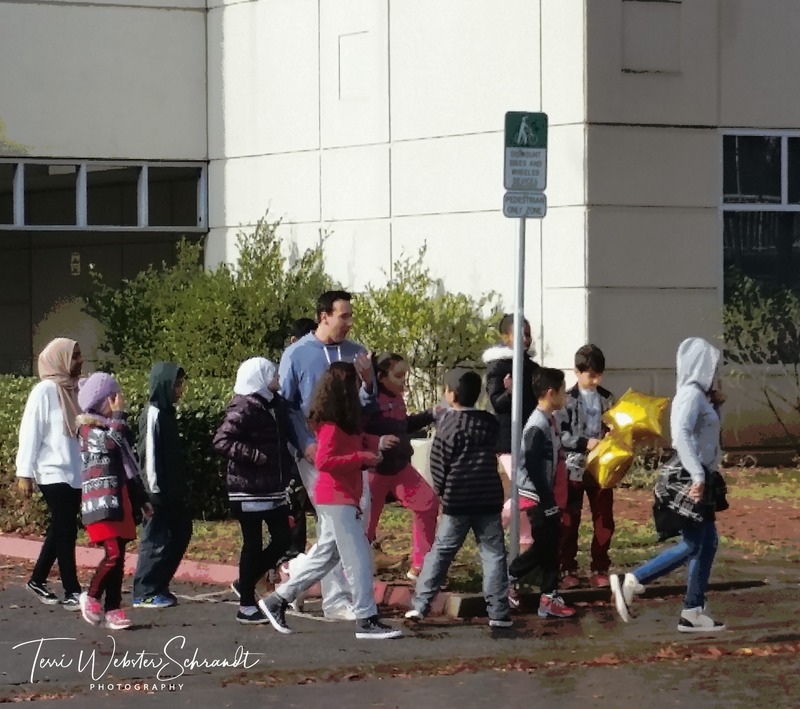 I mentioned before that I love the beginning of the school year where everything seems fresh and new as the Fall gets under way. I’m looking forward to what your posts will cover for the theme, whether you find a fantastic image of an actual school or write a poem or haiku about the subject or just reminisce about a topic related to school. I can see someone posting about adult education, online learning or a myriad of other ideas. Did someone in your family have their “first day” at kindergarten, or high school? Those are important milestones that I’m sure you celebrated to some degree. The sky is the limit. Here are a couple of mine to get you started. Nothing says “back to school” in the non-traditional sense than celebrating with fellow classmates at a class reunion. Photo credit: A friend’s husband took the pic! I can’t say I miss the teenage drama of those days, but fortunately, after 40 years, most everyone has grown up (I say “most” with tongue planted firmly in cheek) and become responsible, wiser adults who have proven to be good friends over the years. There were two events: a Friday night mixer at a San Diego bar and grill, then the reunion itself. I have to say it was the best reunion I have attended (I went to my 10th, 20th, & 30th). Lots of talking, dancing and catching up. 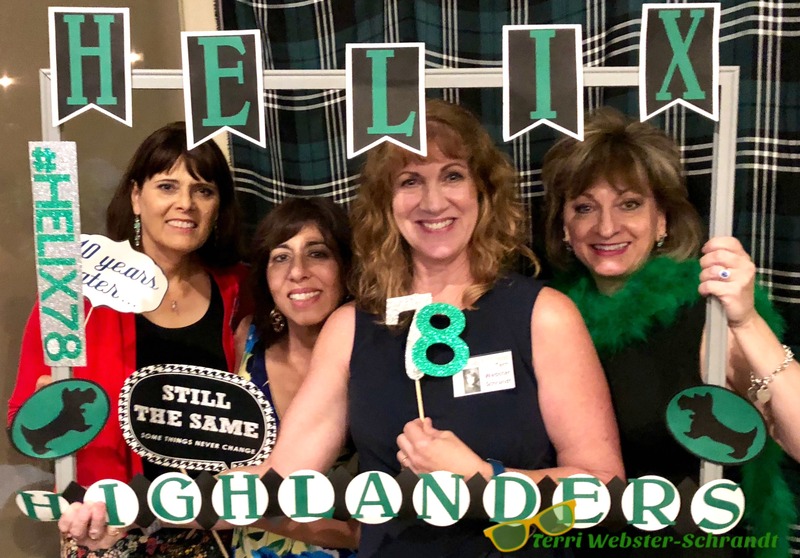 Many thanks to the ladies on my immediate right and left who were part of the reunion event committee. Sadly I’ve heard that class reunions are becoming a bit of an anachronism these days, now that social media keeps people together in some sense. But there is nothing like seeing your fellow classmates in person years later with glasses, wrinkles and extra weight to level the playing field of teenage angst and insecurity that defined high school. Of course I am back to school on my university campus as the semester has gained a foothold into September. A variety of competing coffee shops provides much needed caffeine for overworked students. 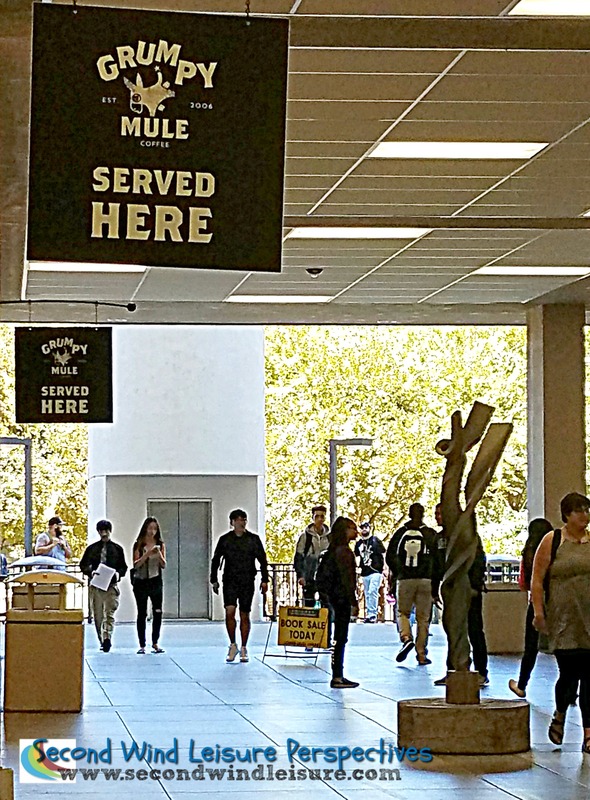 Spurred on by the promise of campus “Grumpy Mule” coffee, student pedestrians make their way to the library. 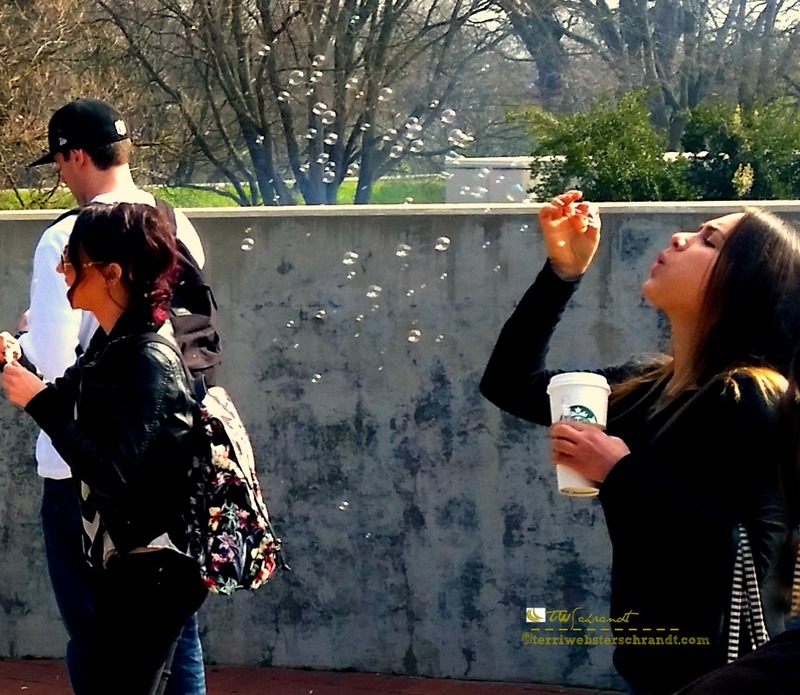 Last spring, I took my leisure education class out onto the campus bridge and had them play by blowing bubbles, but not without coffee! In this photo, a group of youth tour the campus in hopes of becoming future university students. Almost four years ago I wrote a post about The Haunting of Old Coloma School House, which is a historical look at a building where I worked. 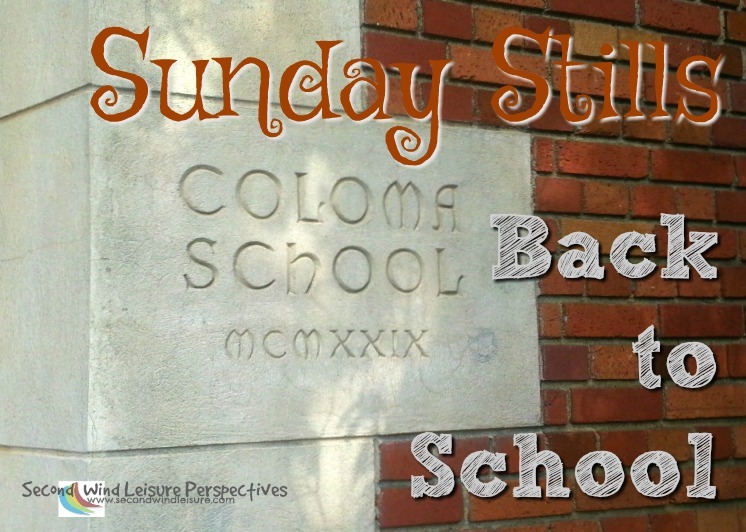 Share your “back to school” themed posts and images for Sunday Stills. Link up below or simply create a pingback to this post! I have never attended a high school reunion. I kept in touch with my grade school BFFs but generally ‘ran away from home’ after high school graduation. I’ve recently stuck my toe in the water on FB and have reconnected with many of the old grade school friends. It’s been such a pleasure that I may attend my 40th if the winds take me that way in 2020. Glad to see you having such a nice time with your friends at the reunion. Are you looking forward to teaching again this year? I know you would love seeing your friends after all these years, Lisa. My fall semester is off to a great start, thanks! There really is nothing like face to face communication. It makes it easier to connect and to say things that don’t come off well in comments. Social media as a replacement? Facebook might be a little bit (I’m not on Facebook). Instagram is definitely not a replacement. WhatsApp is closer than any of them, at least for me. This post got me thinking. Very nice! Millennial students find online classes difficult because of what they feel is a lack of structure that they are used to. I love seeing the students and gauging their reactions in class! LOve your reunion pic, which brought to mind one of mine, and some “old school” pics! School reunions look and sound like so much fun. I’ve been very unlucky, graduating at high school and college, in the way that there have been no reunions whatsoever. Nobody has taken up the task to put something together. Every summer I end up visiting Belgium, I hope there will be a reunion somehow, since both my graduations have been well over ten years now, but… nothing. And, I’m in no position to start and organize something like that, not even living there anymore. It’s a pity. Facebook is not the same, I agree. And, many of my peers from that time aren’t even on it. I’m glad school has started again, because the national parks and popular attractions are less crowded now. 🙂 Have a fantastic school year, Terri! That is sad to hear, Liesbet! School connections are still important although some choose to shun their reunions. Sad that many folks have deleted their Facebooks and social media due to privacy concerns. Aside for school traffic, I can already see the difference in tourist areas around here! It was so much fun! Thanks, Deb! I’m glad you enjoyed your reunion. I had mine last summer and enjoyed it more than any other. It’s true, most people had grown up and the old cliques were mostly gone and people were nice and everyone talked with everyone else. It was nice to see. That 40 makes me feel old though. It doesn’t seem like that long ago and I certainly don’t feel 40 years older! You all look great! Thank you, Michele! Glad to read some folks are still enjoying their reunions! You are so right about the cliques, thank goodness most of us all grew out of that stage! Hope you get to go to one of yours someday, Richa! Glad to hear you had a fun time at your class reunion, Terri. Here in the UK, I’m not so sure they happen very much now, but I could be wrong. I remember them being all the rage when one of the first social media sites, Friends Reunited, was popular. I remember joining up, but nothing about any school reunions. Maybe I’m one that the organisers haven’t been able to track down…yet? Here in Swansea Bay. back to School has certainly kicked in. Everything is quiet again. The weather can sometimes be nice, so it’s great to get out in the sunshine and not have to queue up to use restrooms, eat in restaurants, footgolf course, or go to the cinema. Plus, the cycle tracks are also quiet during the week. This year’s reunion, although I knew about it and who a couple of the organizers were, I still had to find the invite on Facebook, otherwise I might have missed it. Gone are the days of snail mail when we would get a flyer in the mail! I’m glad you found out about your reunion. It must have been like stepping back in time. There’s a great Twilight Zone episode about some senior folk in a care home going back in time. One that stuck with me. I LOVE that TZ episode, Hugh! I have used that video to help teach the concepts of play and aging in a couple of my classes the last few years. It really hits home with the students! What a fun school reunion. My “back to school vibe” is now lounging in bed the first day that the school bus rolls by for the new school year. Shear luxury! Now that is the right way to approach the school year after all of your years of service, Donna! That is so awesome ! 40 year reunion! That is something to celebrate. I somehow doubt that anyone in our class would arrange a reunion. Have an awesome rest of your weekend, and cheers to a wonderful new week to come. Happy to hear you had a great reunion. The only reunion I remember hearing about, many years ago, was to celebrate the anniversary of the founding of my old high school – 500 years before! Here’s my contribution: https://grahamsisland.com/2018/09/16/spinner-dolphins-2/. Fun post Terri. Have you ever noticed it’s mostly the good-looking people who have managed to stay in reasonable shape that end up coming to class reunions?! LOL. I went to my 5 year reunion a long time ago. Guess it was too soon, as I found it pretty mediocre. Haven’t been to one since! Enjoy your new school year! Haha, that may be true, Tina! We waited 10 years before we officially had ours. The majority of people still live in the San Diego so we that moved away relied on the reunions to see each other. Thank you! I attended my 45th mini-reunion last night and had a great time. I almost didn’t go but I’m glad I did. At first I couldn’t believe how many old people were there… but then they started to look familiar. I’m glad you had a good time at your reunion too. Haha, so many old people! I’m afraid that’s how it is now! Glad to hear you went, Janis! Bubbles are fun! I challenged my new chemistry students to make the bubbles as big as possible by making their own solutions and refining them to get even bigger bubbles. How cool, I will check that out! Sounds like a great challenge! Would I love to take your class. I could walk around blowing bubbles but without the context of your class, I’d be speaking to the wind. Seem to do that all the time anyway. Enjoy your new teaching year, Terri. Thanks so much, Shari! I miss teaching that class these days! I never thought about how reunions could be going the way of the buggy whip with social media instead…. i bet you had a fun time, Terri!! I was surprised to learn that, too, Jodie. It really was a blast! Not sure I have anything that fixes this theme.